This is one of my favourite dishes. I make the sauce myself as it’s so easy and tastes much better than the shop-bought variety. Using courgette in place of spaghetti gives this dish a healthy boost, and turkey mince is much leaner than beef, so this recipe is perfectly healthy. The first step is to make the courgetti. I use about three courgettes to serve two people. For this, I use my spiralizer (a kitchen marvel! ), but if you don’t have one it’s still really easy. Cut both ends off the courgette and discard them. Using a vegetable peeler, create thin ribbons of courgette by running the peeler from top to bottom. Once this is complete, stack a few ribbons on top of each other and slice thinly all the way along. The aim is to create thin strips of courgette that look like spaghetti. Next, it’s time to make the meatballs. Mix the turkey mince, cayenne pepper and salt together in a bowl. Once combined, grab small handfuls, roll them into balls and them place on a tray lined with baking paper. Bake your turkey meatballs for 25 minutes at 180°C. Fresh tomato sauce tastes so much better than shop bought, and is really simple to make. First, slice the tomatoes (use different types of tomato for a bit of variety) and peppers, then roast them in the oven at 200°C for around 20 minutes. While your tomatoes and peppers are roasting, sauté a diced onion with a little oil or butter until softened. Once your tomatoes and peppers are slightly chargrilled, add them to a food processor with your softened onions and a pinch of salt and pepper. Blitz it all together to make your simple, tasty tomato sauce. If it’s looking a bit too dry, add a splash of water or tomato passata for an extra kick of flavour. Next, it’s time to cook the courgetti. Add it to a large saucepan with a knob of butter and cook over a medium heat until it’s heated through. This should only take around 5 minutes. Plate up the cooked courgetti, pop the turkey meatballs on top and ladle over your yummy homemade sauce. Bon appétit! 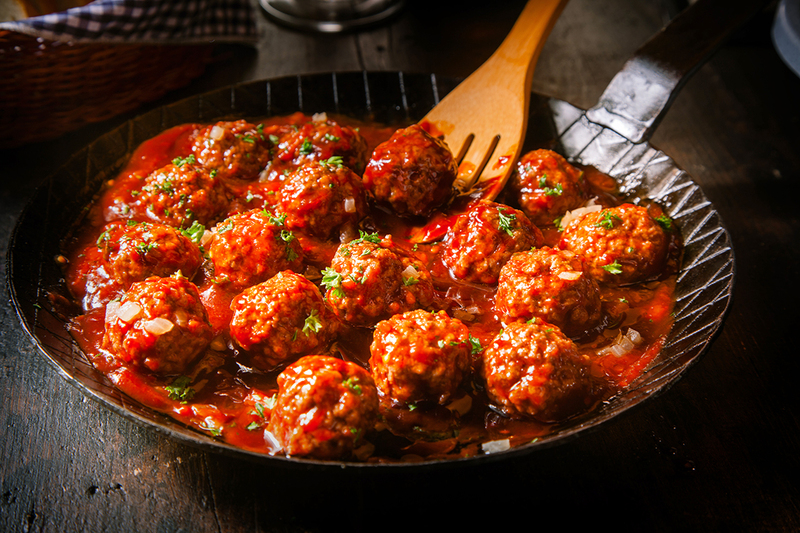 Join the meat tribe and cook up this delicious meatball dish on a Leisure range cooker. Take a look at our gas range cooker collection, our cookers come in varying sizes to fit your kitchen, from 60cm to 110cm range cookers.